Global data solutions provider Return Path today announced a groundbreaking new addition to its robust suite of email deliverability and optimization product offerings. Leveraging Return Path's advanced analytics capabilities, Dynamic Optimization utilizes the individual client's ESP data to provide customized sending recommendations designed to solve specific email marketing problems like low inbox placement and subscriber list fatigue. 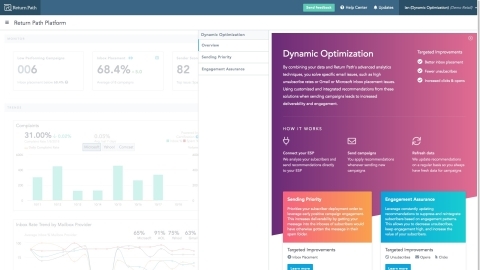 Dynamic Optimization is unlike other solutions available to email marketers today. Powered by EmailDNA, this revolutionary offering goes beyond best practice recommendations to provide truly customized solutions that can be integrated directly into the marketer's workflow. Not only that, the solution actually learns over time, becoming smarter as new data is fed into the model. "Every email marketing program is unique, which means that challenges like low inbox placement or a high unsubscribe rate require more than generic bet practice advice," said Scott Ziegler, vice president of product management at Return Path. "With Dynamic Optimization, we're using advanced analytics combined with the client's own data to provide customized, actionable solutions to their specific email issues. As a result of using Dynamic Optimization, customers will see improved deliverability, better subscriber engagement, and increased ROI from the email channel." Sending Priority: Major mailbox providers like Gmail and Microsoft (News - Alert) rely heavily on real time engagement data as part of their filtering algorithms, which can make inbox placement more difficult. To solve this problem, Return Path's Sending Priority solution applies advanced analytics to a client's data in order to classify each individual subscriber based on engagement. These results generate unique, specific, and customized recommendations on exactly how to prioritize email sends for each group within a given campaign. Sending to the most engaged subscribers first gives spam filters time to react, and the positive engagement from this initial send leads to improved inbox placement for the campaign's remaining segments. Engagement Assurance: Sending too much marketing email can drive subscribers to disengage, leading to elevated unsubscribe rates and decreasing the lifetime value of a subscriber list. Return Path's new Engagement Assurance solution identifies fatigued subscribers who should be temporarily suppressed from further email sends, in order to prevent negative engagement and unsubscribes. These recommendations also determine when suppressed subscribers should be added back to the active mailing list. The result: decreased list churn, improved subscriber engagement, and increased lifetime value of subscribers. The recommendations generated by Sending Priority and Engagement Assurance are constantly updated, providing truly dynamic solutions. In addition, these recommendations will actually improve over time as the advanced analytics model "learn" with the addition of new data. "The use of artificial intelligence (AI) in marketing technology is really in its infancy. We believe that AI techniques like advanced analytics and machine learning can liberate marketers from complex data analysis, allowing them to focus on more important aspects of their job," continued Ziegler. "Dynamic Optimization is just the beginning for AI-powered solutions at Return Path. It's truly an exciting time for marketers and marketing technology." In conjunction with this new product launch, Return Path has also released The Power of AI and Email, a new whitepaper that takes a closer look at the concept of AI and provides insight into the many ways that AI can be used in email marketing. The whitepaper also includes expert commentary on the future impact AI will have on the marketing world. Return Path analyzes the world's largest collection of email data to show businesses how to stay connected to their audiences and strengthen their customer engagement. We help mailbox providers around the world deliver great user experiences and build trust in email by ensuring that wanted messages reach the inbox while spam doesn't. To find out more about Return Path solutions, visit us at returnpath.com or request a demo.